Do you or a family member have a serious health condition that requires you to take time off from work? Were you denied leave or terminated because you needed leave from work to care for a close family member who has a serious health condition? Has your employer taken some disciplinary action against you because of "too many absences?" Whether you are bonding with a newborn baby or caring for a chronically ill loved one, you may have a right to take up to twelve (12) weeks of unpaid leave off from work under the New Jersey Family Leave Act. 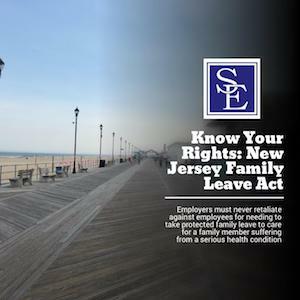 The New Jersey Family Leave Act also prohibits employers from interfering or retaliating against an employee for exercising their New Jersey Family Leave Act rights. If you have been terminated or subject to disciplinary actions because you have “too many absences” for needing to take time off to care a loved one who is suffering from a serious health condition, you may have a legal claim against your employer. We can protect your rights to take a much-needed leave of absence from work without penalty or assist you in determining whether the denial of your request of leave or your termination of employment is unlawful. The employee has worked for their employer for one year and at least 1,000 hours during the last year immediately the preceding the leave. The employer is a public employer or a private employer who has 50 or more employees anywhere worldwide working for at least 20 weeks during the current or previous year. The employee’s salary is amongst the highest 5% of all employees and their absence for work would have a substantial negative effect on the employers business or that the employee is one of the seven most highly paid employee of the employer. An employee who requests New Jersey Family Leave Act must provide their employer advanced or reasonable notice of their need for leave. An employ must provide 30 days notice for leave in connection with the birth or adoption of a child. An employee must provide 15 days notice for leave in connection with the need to care for an immediate family members as a result of a serious health condition. In either case, an exception arises if there is an emergency, which the law then requires that reasonable notice be given by the employee to the employer. An employee may require that the employee provides a certification from a medical provider to support the need for leave. Care for a parent, child under 18 or spouse who has a serious health condition requiring in-patient care, continuing medical treatment or medical supervision. The New Jersey Family Leave Act considers parents to be in-laws, step-parents, foster parents, adoptive parents, or others having a parent-child relationship with an employee. Physical care, emotional support, visitation assistance in treatment, transportation, arranging for a change in care, assistance with essential daily living matters and personal attendant services. The twelve (12) weeks of New Jersey Family Leave Act protected leave of absences can be used intermittently, in days, weeks or hours, or consecutively to eligible employees. Leave for the birth or adoption of a child may begin at any time within one year of the date of the birth or placement of the child. The New Jersey Family Leave Act requires that employers maintain the employee’s group health insurance policy and return the employee to the same or equivalent position that they had prior to going out on the protected leave. 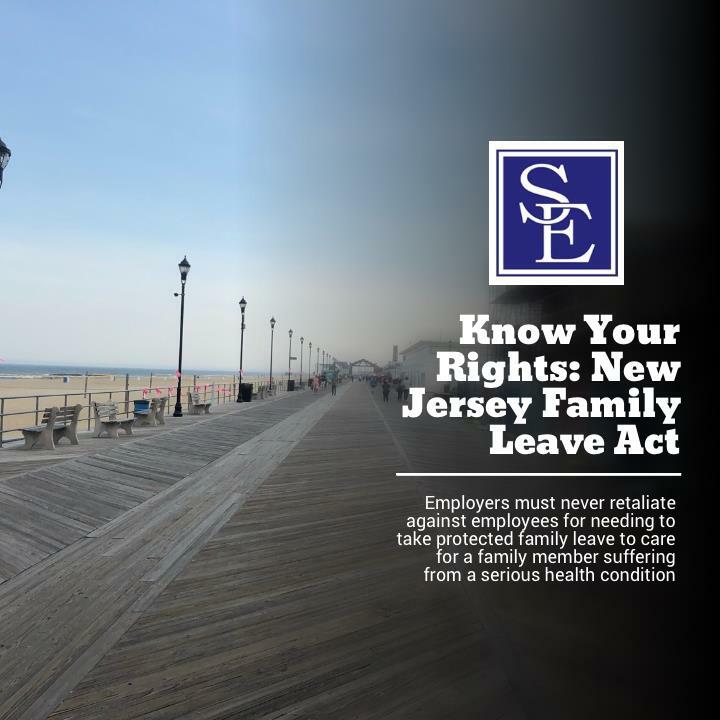 If you have questions about your New Jersey Family Leave Act rights, please contact us to schedule a consultation with an experienced discrimination and FMLA attorney.